Sand dunes a 1,000 feet high, shimmering mirages and scorching temperatures – these are the deserts of northern Namibia. Although this place looks totally inhospitable, there is a remarkable diversity of life found in the sand rivers that dissect the desert dunes. This is the seasonal story of the sand rivers that for 99% of the year hold nothing but sand, yet harbour elephants, giraffe, lions, and baboons. How do these animals survive in the sand rivers of Namibia? This stunning blue-chip documentary will be filmed over the course of a year in the sand rivers of the Kaokoland in Northern Namibia. The film starts in the peak of the dry season. Remarkable heat hazes shimmer off the sand. Mirages fool the eye into believing there are lakes of water everywhere. But the illusion has proved to be fatal to many. Although the dunes are barren, the slender lines that dissect the dunes – the dry riverbeds – show signs of growth. Bushes and plants grow here. And out of the heat haze a vast shape appears. Then another – 27 in all. A herd of desert elephants amble along the dry riverbed scenting the ground with their lazy trunks. These remarkable creatures can smell the water underground and senior members of the herd know where to find it. The herd pauses and the matriarch’s trunk sways back and forwards over the sand – her own inbuilt water diviner. She starts digging, deeper and deeper until water gushes from the ground. It is eleven months since any rain fell here and then it only lasted a few days. Members of her immediate family share the life giving water whilst other older elephants begin digging their own wells. The abandoned wells attract a troop of chacma baboons, a small herd of oryx and springbok in a short time and finally a group of jackals. None of them has seen the pride of desert lions lying in wait. 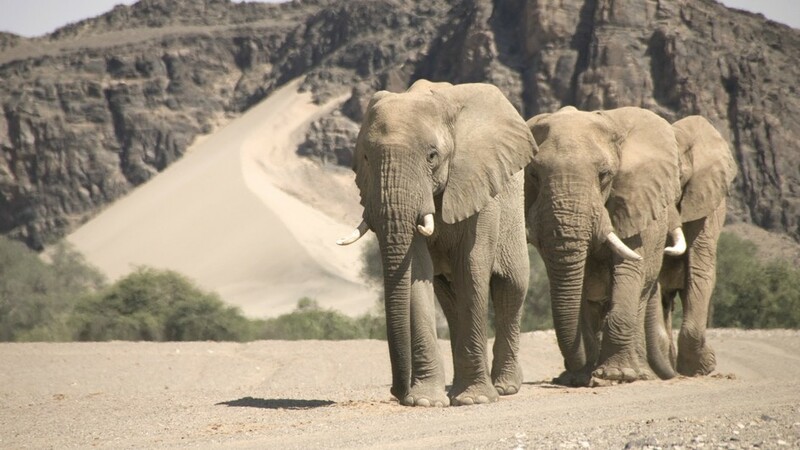 Months without rain and even the desert-adapted elephants are finding it hard. Thunderstorms are rumbling in the Angolan highlands 500 miles to the north – all the desert life here in Namibia is dependent on the rain. But in some years it never arrives – and every creature of the sand rivers awaits its fate. Read more about the adventures behind the cameras in our article: ‘Behind the Scenes: Namibia’s Desert Kingdom’, written by Director Mike Birkhead.